These are the animals that captivate my working life. 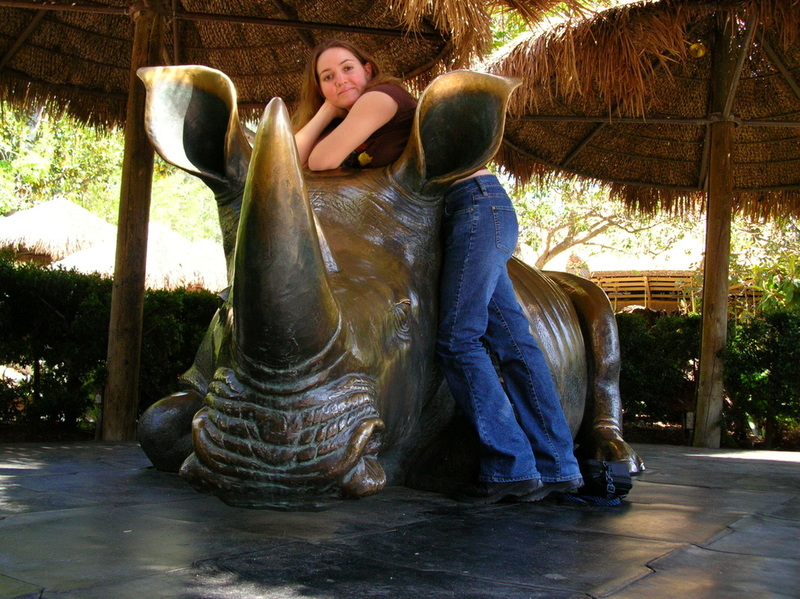 I've been working with rhinos for over 9 years and of all of the different animals I have worked with, rhinos have proven to be one of the most unique and fascinating. Each individual has their own personality and preferences. Some are mellow, some are flighty, some love watermelon while others pretty much just eat grass. 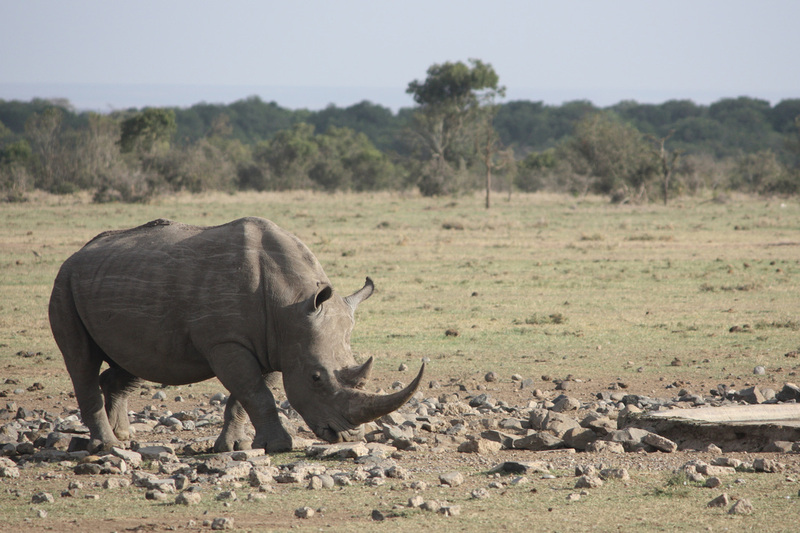 Rhinos have been around for over 50 million years. Today there are 5 species: two located in Africa and three in Asia. Black rhinos are actually not black at all. The species probably derives its name as a distinction from the white rhino (itself a misnomer) and/or from the dark-colored local soil that often covers its skin after wallowing in mud. There are about 4,800 Black Rhinos in the wild. Adults weigh anywhere from 2500 - 3000lbs and can live into their 40s. The white rhino, along with the roughly equal-sized Greater one-horned (Indian) rhino, is the largest species of land mammal after the elephant. The white rhino is the least endangered of the living rhino species with a population of ~20,000. Adults weigh anywhere from 4000-6000lbs. They are called white rhinos because of their wide faces, an adaptation for feeding on the large quantities of grass that makes up their diet. Afrikaans used the word “weit”, meaning "wide", to describe the white rhino's mouth. Early English settlers in South Africa misinterpreted the "weit" for "white". 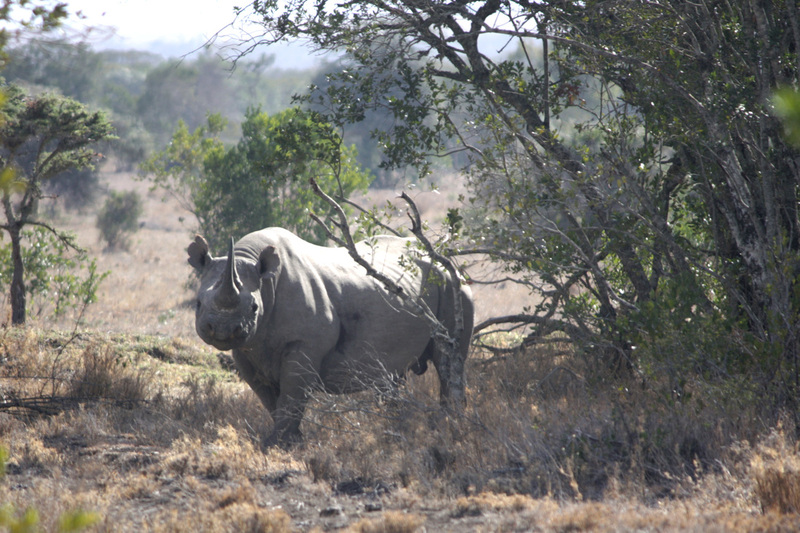 The greater one-horned rhino is one of the two greatest success stories in rhino conservation (the other one being the southern white rhino in South Africa). With strict protection from Indian and Nepalese wildlife authorities, greater one-horned rhino numbers have recovered from fewer than 200 earlier in the 20th century to as many as 2,850 today. The greater one-horned rhino lives in northern India and southern Nepal. In both areas, the species mainly inhabits riverine (flood plain) grasslands. The Sumatran rhino, also called the “hairy rhino” because of its hairy body and tufted ears. It is believed that only around 200 Sumatran rhinos survive in very small and highly fragmented populations in Southeast Asia. The Sumatran rhino lives in dense tropical forest, both lowland and highland, mainly on the Indonesian island of Sumatra and on Borneo. Adults weigh anywhere from 1300-2000lbs. The Javan Rhino is the rarest of the rhino species with fewer than 50 animals. Javan rhinos are found only in Indonesia’s Ujung Kulon National Park and Vietnam’s Cat Loc Reserve, primarily in lowland tropical rainforest. 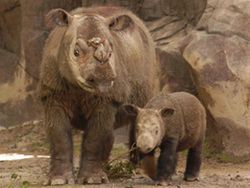 Javan rhinos appear to be more adaptable feeders than other rhino species: in the tropical rainforest where the species now survives, it is a pure browser, but it possibly was a mixed feeder (both browse and grass) in other parts of its historic range where the species is generally believed to have occupied more lowland areas. Adults weigh anywhere from 2000-4,000 lbs. I just completed this video for Rhino Conservation promoting Bowling for Rhinos a national bowl-a-thon. I created it for the American Association of Zoo Keepers, my field's professional organization, who are working to distribute it on a national scale.